Dr. Ameri has been practicing dentistry for over twenty years in the Houston/Humble area. He graduated from The University of Texas School of Dentistry-Houston in 1992. He worked as a hospital administrator at Hermann Hospital while attending dental school. This led to his determination to complete a General Practice Residency program at the University of Texas School of Dentistry-Houston in 1993. This residency, delivering dental care to medically compromised patients in hospital based dentistry, provided a solid foundation for the recognition of the total health care needs of patients. 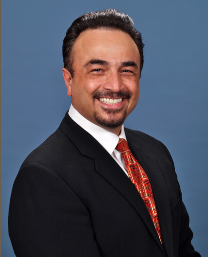 Dr. Ameri constantly strives to improve his skill level and has completed hundreds of hours of continuing education courses in all disciplines of Dentistry. He does this so his patients will have the peace of mind and confidence that Dr. Ameri will provide them the best care possible in one setting, without having to be referred out. Dr. Ameri completed an Implant Preceptorship program at the University of Texas Health Science center dental school in San Antonio in 2000. He gained valuable knowledge both in surgical placement of dental implants and final restorations. He has been awarded fellowship status by the International Congress of Oral Implantologists. Dr. Ameri has a passion for smile makeovers. He has completed numerous advanced cosmetic courses notably at the Las Vegas Institute for Advanced Dental Studies (LVI) where he is a Preferred LVI Dentist. This is a prestigious dental institute, which educates dentists in cosmetic makeovers, while ensuring neuromuscular health and harmony are not compromised during the extensive dental treatment. Dr. Ameri has a very simple, down to earth philosophy when it comes to providing care to his patients : Treat every patient as I would treat a family member.